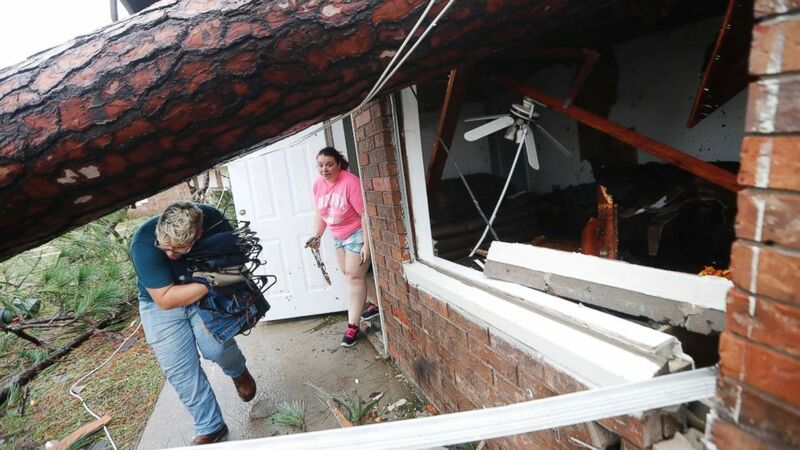 The National Hurricane Center said Hurricane Michael weakened to a tropical storm Thursday, with 50 mph winds as it moved across Georgia. The eye of the storm was 30 miles west of Augusta, Ga., as of the NHC’s 5 a.m. EDT update. The storm was moving northeast at 21 mph with maximum sustained winds of 50 mph. Yesterday when it made landfall in the Florida Panhandle, Michael sustained 155 mph winds, 2 mph shy of a Category 5 storm. Storm surge watches are in effect from the Ocracoke Inlet to Duck in North Carolina. Michael is expected to head northeast through Georgia, South Carolina, North Carolina and Virginia on Thursday as a tropical storm. However, forecasters warn that Michael could intensify again when it reaches the Atlantic Ocean late Thursday or early Friday. Additionally, the NHC forecasts up to 7 inches for eastern Georgia and the Carolinas up to southern New England. Isolated areas could get 9 inches and life-threatening flash floods, and isolated tornadoes are possible Thursday in South Carolina, North Carolina and Virginia.